The Dominican Republic, situated at the midpoint of the Caribbean Sea’s north edge, is a country of mountain ranges, fertile highlands and coastal plains. Just over half the land is agricultural, producing commercial crops such as sugar cane, bananas, coffee, cocoa, rice and tobacco. Nearly half of the rural population, including half a million people of Haitian origin, live below the poverty line. Land ownership is highly concentrated. Most rural poor are landless or own very small plots of agricultural land, and most people in both urban and rural areas lack formal rights to their plots. Over the last 50 years, political upheaval and corruption have hindered a series of efforts to redistribute land and provide greater security of tenure. The failure of the government to effectively address issues of land access and tenure security perpetuates dysfunctional and segmented land markets, with squatting and land invasions becoming common methods of property acquisition. In the last five years, the Dominican government has instituted a number of reforms, including the development of a cadastre with digitized property titles and the establishment and expansion of 23 land registry offices across the country. In 2012 the government created the State Lands Titling Commission, which, working with the Dominican Agrarian Institute, is intended to achieve the titling of around 150,000 urban and rural properties. The Dominican Republic as a whole has an abundant water supply, but contamination of drinking water sources, occasional drought and inadequate sanitation are serious problems. More than one-third of the country is forested, and special incentives now exist to promote the valuation of the environmental services provided by forests, including carbon sequestration. Open-pit mining operations (for gold, silver, copper, zinc and nickel), with effluents containing cadmium, mercury and arsenic, threaten forests, watersheds, and local and coastal ecosystems. The European Union has supported the clean-up of mining sites and helped to develop the Dominican government’s capacity to address the environmental and social issues facing communities in mining areas. The GDR is using the political momentum gained from recent technical achievements in land administration reform to launch a new land registration program, with a goal to title 150,000 urban and rural plots. Donors with experience supporting land rights formalization projects can help the GDR draw on best practices and lessons learned from comparative experience to ensure the inclusion of marginalized groups in any land rights formalization exercise. Donors can also help strengthen the program by supporting investment in plots, promoting legal literacy within the communities and neighborhoods, and building community capacity for organization and collective action to improve livelihoods and increase beneficiary participation in economic, social, and political life. The Dominican Republic has been identified as a country that is likely to experience significant impacts from climate change, and the GDR has already taken substantial steps toward preparation of initial policy and planning level responses. Implementation of strategies for adaptation and mitigation will require strong institutions and coordinated action. Donors can assist the GDR to build and strengthen the institutional framework at central, provincial, and local levels, including strengthening decentralized natural resource governance systems such as Water User Associations and forest user groups. Donors can also draw on experience with internet portals and communication systems to help the GDR design effective tools to help share information and coordinate responses horizontally and vertically. The significant potential for revenue in the Dominican Republic’s mining sector carries an equally significant risk for environmental damage, harm to local communities, and fiscal abuse. The legal framework provides some broad protections, but these stop short of requiring public participation and transparency in negotiations with investors. Despite the constitutional requirement that revenues from the exploitation of the country’s minerals be directed toward development, no specific programs are required. The law mandates that 5% of revenue go to municipalities but there are no restrictions on municipal use of the funds, and no requirement that benefits be shared with the specific communities affected by pollution and displacement. The country’s officials have a dismal reputation for performance of such roles: the World Economic Forum’s Global Competitiveness Index (2010/2011) rated the Dominican Republic 139th out of 139 in “favoritism in the discharge of public duties,” and 134th out of 139 in “diversion of government funds.” Donors can assist the GDR by providing technical support for development of transparent procedures for negotiating with investors and handling revenue. Donors can also help local NGOs build capacity to assist the government by providing oversight of mining operations and serving a public watchdog function. The Dominican Republic is a middle-income country with mountain ranges, fertile highlands and valleys, a high rate of urbanization and land degradation, and persistent poverty. The services sector is the country’s largest employer, with job growth in telecommunications, tourism and free-trade zones. The poor live in rural areas and urban slums, with the poorest communities located in the provinces on the border with Haiti. Rafael Trujillo, a prominent army commander, established absolute control of the Dominican Republic in 1930 and ruled the country as a dictator until he was assassinated by army opponents in 1961. Trujillo took advantage of his time in office to amass vast landholdings, mostly dedicated to sugar and cattle, for himself, his family and his close associates. In 1962 the provisional government, under pressure from emerging democratic reformers to end the extreme concentration of land and widespread poverty, created a land distribution and titling program which continues to the present day. However, a chronic lack of capacity within the implementing agency and a lack of political will have combined to limit the number of beneficiaries to a small fraction of the population. As of 2012, only about a quarter of the country’s rural land –primarily large and high-value holdings –is estimated to be registered, and between a quarter and a half of urban residents have formal rights to their plots. Formalization of land rights has been hampered by a history of political upheaval, corruption and limitations in the capacity and performance of government agencies. Programs requiring joint titling of married couples and partners have done little to increase the percentage of women holding registered titles. Land tenure insecurity persists, fueled by government land expropriations, institutional weaknesses, lack of effective law enforcement and local community support for land invasions and squatting. The country’s land administration institutions have recently been restructured and decentralized, and land records have been digitized. Renewed commitment to the task of registering urban and rural land was announced by the GDR in November 2012. Most commercial farms continue to specialize in sugar cane, rice and bananas; small holders grow a diversity of crops for consumption and sale. Agriculture continues to shrink as a percentage of GDP, but the Dominican Republic’s small farmers have developed a growing niche industry in organic and fair trade products like coffee and cocoa for export and the overall annual growth rate of the sector was 5.4% in 2011. The country sits in the center of the hurricane belt, and tropical storms routinely cause loss of life, destruction of property, and flooding. The government has begun to create strategies to address the expected impacts of climate change on multiple sectors, including agriculture and food security, human settlements, forests, and energy. Local demands on water resources are often at odds with local reserves and limited by existing water delivery systems. The government has been revising and strengthening the legislative and institutional frameworks governing water resources and setting the stage for integrated water resources management. As a geographically diverse island ecosystem, the Dominican Republic has a high level of endemism. Almost all its reptiles and one-third of its vertebrates are threatened or endangered. In the forest sector, the country has maintained the same percentage of forestland over the last ten years, although some observers worry that forestland continues to be degraded, especially in critical watersheds, and plantations are replacing primary and secondary forest. The creation of the Ministry of Environment and Natural Resources, which oversees an environmental assessment process for development projects, has resulted in a greater emphasis on conservation, sustainable development and carbon sequestration. Most community-based forest management appears related to plantation and reforestation projects. The Dominican Republic has at least US $58 billion in mineral reserves, and, from 2009 to 2012, the mining sector received between US $4 billion and US $ 5 billion in investment, primarily focused on the country’s world class gold reserves. The significant environmental and social costs of mining operations in the country have received media attention, and protests staged by environmental activists calling for enforcement of environmental standards have become common. Meanwhile, gold prices remain high and increasing numbers of rural residents in the Central Mountains devote some time to panning for gold in the country’s rivers. The Dominican Republic occupies the eastern two-thirds of Hispaniola Island, which is located in the center of the Antillean archipelago. Haiti lies to the west of the Dominican Republic, and the countries share a 360-kilometer border. The country’s total land mass is 48,320 square kilometers, with water bodies covering an additional 350 square kilometers. Mountains and valleys divide the Dominican Republic into northern, central, and southwestern regions. The northern region borders the Atlantic Ocean and includes coastal plain, the fertile Cibao Valley, and the northern mountain range. The central region includes the Caribbean coastal plain and the Central Range, which runs eastward from the border with Haiti and includes the highest peak in the Antilles, Pico Duarte (3087 meters). The southwestern region contains the Sierra de Neiba mountains and the lowest point in the West Indies, Lake Enriquillo (40 meters below sea level) (World Bank 2012; Haggerty 1989; IBRD and IFC 2009). The Dominican Republic has a population of 10 million. In 2011, 40% of the country’s people lived below the national poverty line. Poverty is more prevalent among rural residents: 48% of the rural population is below the poverty line, as compared to 37% of the urban population. In 2010, the last year for which data are available, 9.9% of Dominicans lived on less than US $2 a day. Many of those who live in extreme poverty are landless peasants in remote rural areas, and depend on intermittent wage labor and sharecropping for their livelihoods. Remittances constitute 66% of the total revenue received by the poorest families, but those families receive only 14% of the total annual remittances of US $2 billion (World Bank 2012; IFAD 2010a; EC 2008). Commercial crops include sugar cane, bananas, citrus, and dairy products, with the number of medium and large-scale enterprises devoted to specialty crops like avocados and tropical fruit increasing. Most small farmers grow food for family consumption and some cash crops. In the hilly western border area, coffee, avocado, and beans are common; in the central and eastern mountains, cocoa is the primary cash crop. In the drier south and northwest and in the lower valleys, small farmers plant rice, beans, cassava, bananas, and tropical fruits. The Dominican Republic has one of the largest organic farming sectors in Latin America, with an estimated 14,000 farmers (many of whom are small farmers) producing organic and fair trade bananas, cocoa, and coffee for export (IFAD 2010a). About half a million people of Haitian origin live in small, isolated rural shantytowns, known as bateys. Built by the State Sugar Council (CEA) and private sugarcane growers, the some 400 to 500 bateys house Haitian-born and Haitian-descended sugarcane plantation laborers and their families, as well as other workers. Despite the efforts of donors and NGOs, most bateys lack access to safe water and sanitation facilities, and few have convenient access to schools and clinics. Even after two or three generations in the country, Haitian-origin batey residents do not have Dominican Republic citizenship status (Ferguson 2003, COTN 2007). The Dominican Republic’s urban areas are growing at an annual rate of 2% and now contain 70% of the country’s total population. An estimated 50 to 75% of urban residents lack formal rights to their plots. Across the country’s cities, about 38% live in slums. These residents lack functioning sanitation systems, access to safe water, and reliable services. In Santo Domingo, home to about 31% of the urban population, informal settlements climb up the canyon slopes and along flood-prone riverbanks. The residents of these settlements are among the country’s poorest people; they live among untreated sewage and garbage, and wash in rivers that are often polluted by industrial and human waste (World Bank 2012; Amnesty International 2011; IRG 2001; Werbrouck et al. 2004). As of 2009, 51% of total land in Dominican Republic was classified as agricultural land, a percentage that has held steady over the last decade. In 2004, a quarter of agricultural land was estimated to be state land, and the rest was privately held. Land distribution is skewed. Small farmers, with holdings between 0.5 and 2 hectares, hold about 2.4% of agricultural land and 65% of total farms. Medium and large commercial farms hold the balance. In 2004, an estimated 6% of agricultural producers controlled 70% of agricultural land, while 80% of farmers held less than 8% of the agricultural land. Only 14% of agricultural land is rented out. Most sugar mills and cane fields are concentrated in the coastal plains in the southeast, with three or four large groups owning 75% of the land. One of the largest operators is the State Sugar Council (CEA), which the GDR created in 1966, largely from lands and facilities formerly held by the family of the former dictator, Rafael Trujillo (Macours et al. 2007; World Bank 2012; FAO 2008; Haggerty 1989). The unequal distribution of land has deep historical roots that have proved difficult to eradicate despite land reform efforts. After the assassination of Trujillo in 1961, the GDR passed the 1962 Agrarian Reform Law, which was designed to distribute land that had been concentrated in Trujillo’s hands to tenant farmers, sharecroppers, displaced families, and other landless or near landless individuals. The distributed land included land formerly held by Trujillo, along with land acquired through donations and spotty application of a land ceiling law (GDR Agrarian Reform Law 1962; de Los Santos and Pena 2007). The success of the reforms has been mixed. Redistribution was slowed by a series of political upheavals. Some large commercial enterprises that were left intact have been collectively farmed. A national survey conducted in the mid-1980s reported that 40% of all households had no land and another 25% held less than half a hectare. Impatient with the pace of reform, peasants began seizing rural land. Their efforts were often successful; local dispute resolution systems often awarded squatters some percentage of land occupied. Land seizures also served as a wake-up call to the Dominican Agrarian Institute (IAD), which is responsible for land distribution. By 1990, IAD had redistributed about 409,000 hectares of land, benefiting 75,000 families with provisional land titles. In 2012, the GDR reported that since its conception, IAD had granted plots to a total of 115,000 beneficiaries, with an average plot size of 3.75 hectares. As of 2012, only 15,000 beneficiaries had received title. An estimated 1.8 million urban lots and 1.6 million farm plots (representing 74% of the country’s farmers) were untitled (Haggerty 1989; de los Santos and Pena 2007; Dominican Today 2012a). The current Constitution of the Dominican Republic, which was adopted in 2010, recognizes and guarantees the right to own private property, and provides that the state shall promote the acquisition of property, especially titled real property. The Constitution further provides that it is “in the public interest that land be devoted to useful purposes and that large estates (latifundios) be gradually eliminated,” and that the social policy of the state shall promote land reform and effectively integrate the rural population to the national development process by encouraging renewal of agricultural production (GDR Constitution 2010a). The Dominican Republic has a civil law system. Historically, the indigenous Taino (Arawaks) had a system of customary law, but the impact of the system on the Spanish colonizers was limited. In 1492, at the time of Columbus’s first voyage, the Tainos were estimated at one million, but the early colonizers were brutal. By 1548, they had reduced the indigenous population to about 500. The Africans imported and sold as slaves to fill the labor gap most certainly had systems of customary law. However, the combination of an already strong civil law system in the country, coupled with the subservient status of the slaves likely prevented African customary law from taking hold. The Dominican legal system is largely based on the French civil code that was adopted in the 1800s and has been subject to multiple revisions and amendments. Some observers make reference to “customary law” –such as in the description of male dominance in the management of household assets and decision making that is contrary to the formal law –but there does not appear to be in place a systematic customary law system (Wilson 1999; Rouse 1993; Hofsteller 2008; USDOS 2012b). The President has the authority to enact laws and resolutions passed by Congress, and has the executive power to issue decrees, instructions, and regulations. Ministries have the authority to issue regulations and instructions consistent with their legislative authority. Property rights are governed by provisions in the Dominican Republic Civil Code (which establishes the rights of land ownership, the alienation of land, and land leasing, renting, and mortgage) and by separate, stand-alone statutes and regulations. Land administration is founded on a Torrens system of land registration, which was adopted in 1920, and a specialized system of land courts. Under the Torrens system, ownership is transferred through registration of title instead of using deeds, and the state guarantees the indefeasibility of a registered interest (Romero 2012; Pellerano and Herrera 2010). In 2005, the Real Property Registry Law No. 108-05 (amended by Law No. 51-07) restructured the procedures and institutions for the adjudication and registration of property rights. The law also provided the foundation for the consolidation of land administration functions within the Supreme Court. The country’s land courts are governed by Resolution No. 1737-2007. The most recent regulations governing land registration are the General Regulations for Title Registry, Resolution No. 2669-2009, amended, and the General Regulations for Cadastral Measurement, Resolution No. 628-2009. Decree 624-12 is the most recent land reform directive, establishing the State Lands Titling Commission and committing to title about 150,000 urban and rural plots (Romero 2012; GDR Real Property Registry Law 2005; GDR 2007; Pellerano and Herrera 2010; Dominican Today 2012a; GDR 2010b). The 2000 Dominican Republic Environment and Natural Resources Law (No. 64-00) governs all policies, plans, and programs that affect the country’s land and other natural resources. The law imposes on development projects an obligation of environmental analysis and planning, and creates a specialized enforcement system within the Office of the Attorney General (IRG 2001). Land in the Dominican Republic is classified as either private or public land. The Civil Code recognizes private land ownership. Private land can be owned by individuals, families, or groups, such as collectives and associations. Ownership rights include the right to use the land, to exclude others from the land, and the right to sell, lease and mortgage the land. The Civil Code also recognizes usufruct land rights, leaseholds and sharecropping, the terms of which are also subject to private contracting law. 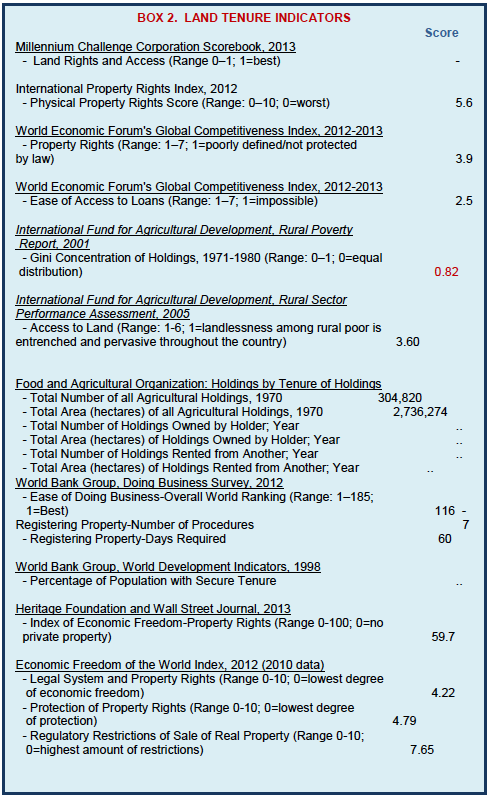 The country’s 1995 Foreign Investment Law (No. 16-95) grants foreign investors the same rights to own property as are guaranteed Dominican Republic investors (Pellerano and Herrera 2010; USDOS 2012a). In many agricultural areas, sharecroppers have traditional arrangements with landowners; the sharecropper agrees to supply labor on the land in exchange for a share of the production, with additional inputs provided by the landowner or shared between the parties. In some parts of the country, however, sharecropping is used by landowners as a method of clearing and improving unimproved land and forestland. A landowner enters into a contract with a sharecropper under which the sharecropper is permitted to cultivate the land and retain 100% of the production. The improved land reverts to the landowner at the end of the contractual term (de Ceara 1986). Most people in the Dominican Republic access land through inheritance, gifts within families, state land reforms, or land purchase. Dominican inheritance law provides mandatory transfers of shares of property to certain dependents, including children. Historically, rural families provided offspring with a portion of the family land when they reached majority. The young adults would remain on the farm, developing their own portion of land while also contributing to the labor on the family land. The growth of population over the last decades has put pressure on the amount of rural land suitable for agriculture and caused a gradual reduction in the size of holdings. As off-farm opportunities expand, many families have adapted to the pressure on land by supporting education, emigration, and urban employment for some children. This adaptation diversified family livelihoods and income sources, limited the number of family members dependent on the farm for their livelihoods, and slowed the division of holdings into smaller plots (Haggerty 1989; Ariza n.d.). The state land distribution program began in 1962 and continues to the present day. Applicants for rural land must commit to using the land for agriculture and working the land as a family unit. Applicants must be literate or have an interest in becoming literate, and have an interest in educating themselves in farming practices. The GDR grants the parcel with restrictions on its sale, lease, or mortgage, and the GDR reserves the right to retake the land if the grantee does not use the land for farming. Revisions to the law in 1997 (Law No. 55-97) included a requirement of joint titling of land granted to domestic partners and married couples. The most recent land distribution program, which encompasses urban plots, requires applicants to have resided on the land for at least five years (GDR Agrarian Reform Law 1962; Dominican Today 2012a). Under Dominican Republic, all land must be registered; all unregistered land is considered state land. Registration requires seven steps, an average of 60 days, and payment of 3.7% of the value of the land as a registration fee. The landowner is required to have a survey of the land, a certificate demonstrating that property taxes are current, and a certificate from the Title Registry Office that evidences any encumbrances on the land (such as mortgages or easements) and serves as a check on the extent of land rights to be transferred. Legal ownership of land is evidenced by a Certificate of Title issued by the Title Registry Office in the jurisdiction where the land is located; the Certificate of Title is presumptive evidence of the land right documented (GDR Real Property Registry Law 2005; World Bank 2012b; Ariza n.d.; GDR 2010b). The GDR guarantees the title of registered property. Amendments to the 2005 Real Property Registry Law established a new 2% tax on all land conveyances to establish an indemnity fund. Buyers can also purchase title insurance from private insurers. To date, the indemnity fund is not operational (GDR Real Property Registry Law 2005; Ariza n.d.; GDR 2010b). Despite the requirement of land registration, most land in the Dominican Republic is not registered, and even if land rights are registered, tenure is not assured. In some parts of the country, unregistered land has been expropriated for development without notice or compensation. In some cases, however, holders of title certificates have received little or no additional security. Long-standing titling practices –such as issuing provisional titles that are never completed, or providing title to land to multiple owners without requiring individualization of parcels –have created substantial ambiguity in rights and undermined the reliability of land records. Some of these practices have been curtailed in the last few years but nonetheless undermine the reliability of existing land documentation. In addition, the country has struggled to control fraud in the creation and registration of land titles, including illegal operations within the government agencies responsible for issuing titles. In 2009, a land title forgery ring was uncovered; it had been operating for years and involved a Supreme Court auditor, private lawyers, and employees of the judicial branch, the police, and the military (Dominican Today 2009; Dominican Today 2011; Ariza n.d.). Almost exactly half of the population of the Dominican Republic is female. In 2007, survey respondents reported that 35% of the country’s households were headed by women, and women constituted 39% of the economically-active population in 2010. Women are most commonly employed in services (83% of female employment). Trafficking of girls and women is a chronic problem (World Bank 2012; EC 2008). The 2010 Dominican Republic Constitution recognizes the equality of women and men. The Constitution prohibits any act that impairs or nullifies the recognition, enjoyment, or exercise of the fundamental rights of women and men on an equal basis. The Constitution provides that the State will promote the necessary measures to ensure the eradication of inequality and gender discrimination, including promoting and ensuring a balanced participation of women and men as candidates to elective office and in state decision-making bodies. The country created a national-level Secretariat for Women in 1999 (now the Ministry of Women), and the Ministry of Agriculture includes an Office of Women, which is charged with furthering the rights of women. Despite these institutional efforts, however, women remain underrepresented in the political sphere (GDR Constitution 2010a; FAO 2008; EC 2008). 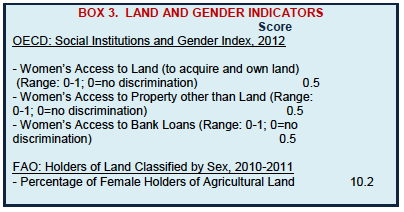 In large measure, the country’s legislative framework impacting rights to property reflects the constitutional commitment to gender equality. The country has adopted a series of legal and institutional reforms supporting women’s rights, including in the areas of family law and property rights. Statutory law supports principles of nondiscrimination in employment: married women have the same legal rights as single women and can exercise freedom in their professional lives. The law also recognizes community property rights: both spouses must consent to the sale or mortgage of real property, and widows have a right to inherit marital property. The law does not, however, recognize common law marriage and the rights of common-law spouses to property. The Agrarian Law, which set the stage for the state land redistribution program, was revised in 1997 to mandate joint titling of land distributed to spouses and partners, including common law spouses. As such, the land reform law set a more progressive standard than do the broader civil laws governing marriage and property rights, which do not recognize common-law marriages. Statistics regarding the extent of land registered jointly or individually under the Agrarian Law and related programs do not appear to be reported (FAO 2008; IBRD and IFC 2009). Despite the recognition in the Agrarian Reform Law of the rights of women, very few women earn income in the agricultural sector. In 2007, only 2% of economically active women were employed in agriculture (compared with 21% of economically active men). The domestic duties of most rural women include working the family plot and caring for livestock. However, these women are not considered agriculturalists and, therefore, often lack the status to participate on an equal basis with men in rural programs, and women frequently do not share in the benefits accruing from agricultural production (World Bank 2012; FAO 2008). Land administration functions in the Dominican Republic are currently housed within the Supreme Court of Justice. The overarching land administration agency, Real Property Authority (Jurisdicción Inmobiliaria), includes the National Directorate of Title Registry, decentralized Title Registry Offices, the National Directorate of Cadastral Measurements, and the land courts (GDR Real Property Registry Law 2005). The Registry of Deeds is headquartered in Santo Domingo and is responsible for coordinating and managing the country’s land records, creating standardized land forms; proposing necessary land-related regulations, unifying and harmonizing land registration processes, collecting and publishing statistical data regarding title registration, and supervising the functioning of the provincial and municipal-level registries. The Title Registry Offices are subordinate to the Registry of Deeds, and provide access to land administration services, including title searches, land transfers, and land registration. The Cadastral Measurements Directorate is responsible for surveying and mapping, and creation and maintenance of the cadastre. Specialized land courts have exclusive jurisdiction to hear property disputes, and the Property Commission serves as prosecutor, representing the state’s interests (GDR Real Property Registry Law 2005). The Ministry of Agriculture’s mission is to create policy, techniques, and programs to facilitate agricultural development, including developing the legal and institutional framework; and facilitating collaboration of public and private sectors to maximize the contribution of agriculture to development. Ministerial functions include: (1) developing and leading the country’s agricultural policy; (2) in collaboration with the National Planning and Coordination Ministry, studying the country’s agricultural situation and submitting plans for consideration in the GDR’s overall plan; (3) coordinating programs; studying the economic and social aspects of the production, distribution, and consumption of agricultural products; (4) ensuring preservation of natural renewable resources; (5) promoting improved agricultural technology and staff training; and (6) promoting and conducting scientific research in the field of agriculture. The National Agriculture Council (CNA), which is housed within the Ministry of Agriculture, was set up as an agriculture and natural resources advisory board (GDR 2012a; IRG 2001). The Dominican Agrarian Institute (IAD) was established in 1962 as a stand-alone agency to manage the acquisition of agricultural land and land distribution. IAD has also played a role in organizing small farmers into farmer and producer associations, and in providing capacity building. IAD is very centralized and in the course of numerous political regime changes has suffered disruption, and the waning of political will. The pace of land reform has been quite slow, and some observers have suggested that the agency’s technical ability is weak. In November 2012, the GDR established the State Lands Titling Commission to work with IAD to title land, including IAD-distributed land (IFAD 2010a; Dominican Today 2012a). The Dominican Republic has a dual land market system. The formal market is reserved for land that is titled and registered and is thus primarily limited to commercial properties, larger parcels of rural land, and urban plots in planned and serviced areas. Plots in informal settlements and most rural plots are not titled and registered, and rights are transacted on the informal land market. Both markets are relatively active, with foreign investment pushing up prices in urban areas and in valuable rural locations (Shearer et al. 1990; IFAD 2010a). One recent study suggests that the general insecurity of land rights is limiting the land rental market and access to land by the poor. Research in two regions of the Dominican Republic found that large tracts of land were underused by landowners and could be more profitably rented. However, fearing that tenants will obtain permanent rights to land, landowners either forego renting out their land or rent it to members of the same social class. The socially segmented land rental market prevents the poor from accessing land held by those in a higher economic class, and leads to inefficient land use (Macours et al. 2007). The GDR program of land distribution grants beneficiaries provisional title. Beneficiaries are prohibited from selling, leasing, renting or mortgaging the land until they pay the full price of the land and a definitive title is granted. Nonetheless, by some estimates, as of the mid-1980s as many as 50,000 beneficiaries of the land distribution scheme, most of whom had only a provisional title, had transferred their land. The prices paid were lower than market value because of the restrictions on the transfer and the right of the GDR to seize land for unauthorized use or alienation. Studies on more recent transfers of land reform land have either not been undertaken or their results not widely reported (Shearer et al. 1990). The 2010 Constitution and the Real Property Registry Law 108-05 provide that no person shall be deprived of his or her property except in the public or social interest. Public interest is not defined with any specificity. Any expropriation in the public interest must be accompanied by payment of compensation based on fair value of the property. Fair value shall be determined by court judgment or agreement of the parties (GDR Constitution 2010a; GDR Real Property Registry Law 2005). Land expropriation has been relatively common in the Dominican Republic, primarily related to infrastructure development. However, payment of compensation in accordance with the Constitution and law has been spotty; in some cases landowners wait years for payment, or remain unpaid. Problems with payment have been attributed to errors committed by government-contracted property assessors, the slow pace of correcting land titling errors, and other technical problems. In 2005, USAID worked with the Dominican government to review 248 expropriation cases involving U.S. citizens. As a result of the effort, about 65% of the cases were resolved by paying the claimant or dismissing the case (USDOS 2012a). In some cases, donors and project contractors have been instrumental in ensuring that the letter and spirit of the expropriation laws were followed. In the development of the Coral Highway linking Santo Domingo and the Punta Cana region, for example, all landholders who were resettled received compensation for the value of their land. Compensation was paid whether landholders had title or not, and whether their land was registered or not. More commonly, however, evictions are without compensation and can include violent tactics. In 2011, wielding a decree of public utility that was more than a decade old, police destroyed an informal residential enclave on private property in Santo Domingo, despite a pending protective order. Police used tear gas and fired buckshot to clear the land, and after residents fled and the smoke cleared, local government officials were seen helping themselves to the appliances and personal possessions of the former residents (Odebrecht 2010; Amnesty International 2011). The Dominican Republic judicial system includes the Constitutional Court, the Supreme Court of Justice, three courts of appeal, 26 provincial Courts of First Instance, one Court of First Instance in the National District, Justices of the Peace in the country’s 72 municipal districts, and a specialized court system that includes Land Courts. The judicial system is headed by a Supreme Court with nine judges, which rules on constitutional questions and serves as the final appellate court. Supreme Court judges are elected by the Senate and cannot be removed from office. The Supreme Court appoints the judges of the lower courts and of the special courts. The judicial system recognizes alternative dispute-resolution (ADR) procedures as a legitimate method of resolving disputes (Romero 2012). At the time that the Dominican Republic adopted the Torrens property system it also adopted a separate system of Land Courts. The land court system has undergone multiple reforms since then, most recently in connection with the Real Property Registry Law in 2005. The Land Courts are concerned exclusively with land rights, procedures relating to clearing title to property, registering real property, and resolving other questions relating to real property. The Land Courts include 31 Land Courts of Original Jurisdictional and three Higher Land Courts sitting in Santo Domingo, Santiago, and San Francisco de Macorís, which serve as appellate courts. The Supreme Court reports a high rate of resolution: of the 8,007 cases filed in 2011, 7,847 were reportedly resolved (Romero 2012; GDR Real Property Registry Law 2005; GDR 2011a). Land disputes often involve competing claims based on title documents which have been vulnerable to forgery and fraud. Recent completion of the process of digitizing records, updating land registration procedures, and increasing transparency of GDR processes and procedures are expected to help reduce these problems. In addition, the GDR has eliminated some practices (such as the issuance of provisional titles) that caused ambiguity and sparked disputes. Some high-profile land cases have been advanced on behalf of peasant occupiers of land. In 2012, the Constitutional Court held that IAD could not evict peasant cultivators who had occupied a farm project for 28 years in western San Juan de la Maguana province (El Judicial 2010; Dominican Today 2012b). Rural land disputes arising from peasant land invasions and seizures contribute to persistent rural land tenure insecurity. As in many other Latin American countries, local community land-dispute resolution efforts in the Dominican Republic often favor squatters. Fearing permanent loss of land rights, many landowners avoid renting out their land to potential squatters, and defend their often underused land from invasion (Macours et al. 2007). In November 2012, the GDR announced a new program to title state lands, especially those on which land reform and housing projects have been established. The program was developed to address the limited number of beneficiaries of state land grants with titles. The GDR created the State Lands Titling Commission to work with the Dominican Agrarian Institute (IAD) to title around 150,000 properties by the beginning of 2017. The first titles were issued in December 2012 to people who had squatted in the Los Mina area of Santo Domingo since the 1970s. President Danilo Medina has promised there will be a total of 20,000 new titles by the end of 2013. To obtain a title, a person must have occupied and worked the land for more than five years. It is unknown whether there will be any restrictions on the titles issued (Dominican Today 2012a; Dominican Today 2012d; Dominican Today 2013a). In the last decade, the GDR has implemented reform programs focused on developing institutional frameworks and strengthening government agencies and public administration. As part of its overarching program to modernize the justice sector, the Dominican Republic Supreme Court modernized its property title registration process through a US $10 million IDB loan in an effort to address deficiencies and gaps in the land administration system and strengthen land tenure security. The project involved digitization of land records, decentralization of registries, establishment of a fund to compensate people for title errors, separation of the legal and administrative functions within the agency, and redefinition of the roles and responsibilities of judges and courts. The project, which ran from 2007 to 2011, succeeded in digitizing all of the property titles and registered land rights in the country. The project also supported the development and expansion of 23 registry offices across the country, and the development of a cadastre. The time required to register property was reduced by 56%, and the use of mortgages to secure transactions increased 41% (El Judicial 2010; IADB 2006; IADB 2012a). With the support of the United Nations Development Programme (UNDP), the GDR has undertaken various initiatives to support sustainability of land management. Capacity Building for Sustainable Land Management in the Dominican Republic, a three-year project (2008–2011) that includes US $1.3 million from UNDP, is designed to improve institutional and individual capacity to coordinate, implement, sustain and evaluate sustainable land management options to reverse desertification and land degradation. The project was scheduled to conclude in 2011 and has not yet reported results (GDR and UNDP 2007). The International Fund for Agricultural Development (IFAD)’s Dominican Republic Country Strategic Opportunities Programme (CSOP) (2010–2014), a US $48 million effort, is focused on expanding small farmer access to agrifood markets, improving small-farmer access to market-driven and climate-change-adapted farming practices and technology, increasing human and social capital. and developing off-farm small enterprise and employment opportunities for the rural poor, particularly women and young people. IFAD earmarked US $28 million of the US $48 million total for the Development Project for Rural Poor Economic Organizations of the Border Region and the Rural Economic Development Project in the Central and Eastern Provinces. The project strategy included plans to identify and promote feasible methods of addressing issues related to land access and tenure security for small farmers (IFAD 2010a; IFAD 2010b). The United States Agency for International Development (USAID)’s project, Promoting Modernization Reform in the Justice Sector 2008–2012 (Proyecto de Justicia), provided technical assistance to Dominican justice institutions to support policy-making, administration, and operations management. The project included support for the creation of a locally owned strategic plan for the justice sector, and a grant-funded Community Justice House (Casa de Justicia) program that was designed to improve the average citizen’s access to justice. One result of the project was an expanded Jurisbook, a case-tracking and management system, to provide computer-based, automated management of hearings and a calendaring system (DAI 2012; TetraTech DPK 2012). USAID has also funded the Rural Economic Diversification Project (USAID-RED) (2008–2011), an US $11.7 million project designed to support small-scale producers and processors of agricultural and wood products in diversifying and expanding their production. The project’s goal is to enable the small-scale operators to become more competitive in global markets and take advantage of the opportunities created by adoption of the U.S.-Dominican Republic-Central America Free Trade Agreement (CAFTA-DR) and other free trade agreements. The project includes components focused on the development of public-private partnerships, natural resources management, and organic agriculture. The USAID-RED project has increased the ability of Dominican rural and agricultural micro, small and medium enterprises (MSMEs) to compete in the world marketplace and to do so sustainably. From 2008 to 2012, the value of exports of the project’s targeted commodities increased 57.4%, and the quantity of domestic sales increased almost 116.4% (USAID 2012). The Dominican Republic is home to active civil society organizations, including the powerful NGO, Citizens Participation (Participacíón Ciudadana). Citizens Participation is a nonpartisan NGO with a mission to promote participation within civil society, encourage the participation of citizens in the achievement of political reforms and democratic institutions, help ensure rational use of public resources. and support balanced social development. The NGO serves a watchdog function and is active in investigating and publicizing corruption in government offices. In December 2012, the NGO called for the GDR to allocate legislatively-mandated funds to support the development of an independent judicial sector (Participacíon Ciudadana 2012; Dominican Today 2012c). International NGOs are also active in the Dominican Republic. Habitat for Humanity, for example, has worked in the country since 1986, and provides low-income families with decent and safe housing. The organization reports having provided houses for 3400 Dominican families in Barahona, Polo, Paradise, Tamayo, Jaquimeyes, Nagua, San Juan de la Maguana, San Francisco de Macorís and Santo Domingo (Habitat for Humanity 2012). The Dominican Republic has a moist, tropical climate, with seasonal and spatial variability in the abundance of rainfall. The country receives an average of 1500 millimeters a year, ranging from 500 millimeters annually in Rio Yaque del Norte basin to 2250 millimeters in the Yuna River basin. The western part of the country, including the interior valleys, is generally the driest. The country is in the hurricane zone, and tropical cyclones occur on the average of once every two years. Over 65% of storms strike the southern part of the country, and can produce winds in excess of 200 kilometers per hour (FAO 2000; Haggerty 1989). The country has over 400 rivers and 60 river basins, seven of which are major drainage basins. Five of these rise in the Central mountains, the sixth in the Sierra de Yamasá. The seventh drainage system flows into Lake Enriquillo. The lake covers 265 square kilometers, sits 40 meters below sea level, and is the only saltwater lake in the world inhabited by crocodiles. The Yaque del Norte is the country’s most significant river, flowing from the Central mountains and running 296 kilometers, forming a delta where it empties into Monte Cristi Bay on the northwest coast (Haggerty 1989; FAO 2000; IBRD and IFC 2009). The Dominican Republic has 21 billion cubic meters of annual internal, renewable freshwater resources. Agriculture accounts for 64% of withdrawals, followed by domestic use (34%) and industry (2%). With a per capita endowment of 2088 cubic meters per year, the country’s freshwater resources are considered sufficient to meet present and future demands. However, the water resources vary spatially, and current levels of water use by the different sectors and distribution inefficiencies strain resources. For example, coastal limestone aquifers contain only about 4% of the available groundwater reserves, but human activities in the southeast of the country (from Santo Domingo east to La Romana) are heavily dependent on them. In addition, the effects of severe weather, population growth, unregulated tourism development, and inadequate planning have polluted some water resources. Upper watersheds suffer degradation from frequent severe tropical storms and logging in mountains and hillsides, hillside agriculture, and cattle ranching. Lower watersheds, particularly urban floodplains, are degraded by the impact of high density human occupation. In some areas, water quality close to agricultural, urban and industrial areas is affected by high salinity, pesticides, and other pollutants (World Bank 2012; Werbrouck et al. 2004; GDR and UNDP 2007). Government statistics on access to piped water report high levels of access in urban areas (94%); an estimated 65% of rural residents have access. However, most people in rural areas and many in urban areas do not have indoor connections and must walk to a public standpipe. In addition, chlorination is not widespread, so piped water is not consistently safe. Several types of rural water systems are used, including simple gravity-fed systems with public or household taps, hand pumps, diesel or wind/solar powered-pumps, and more technically complicated piped systems with electromechanical pumps powered from the national electricity grid. In some areas, the infrastructure is not well designed for the terrain maintained, and piped water is not consistently treated. Only about 20% of sanitation facilities are connected to a sewerage system, and contamination of drinking-water sources is relatively common. Waterborne diseases are thought to contribute to the deaths of between 2400 and 3200 children under five each year (Werbruck et al. 2004; Lockwood 2001; GDR and UNDP 2007). Roughly 80% of crop land in the Dominican Republic is rainfed. About 710,000 hectares of land are deemed suitable for irrigation; about 270,000 hectares were equipped for irrigation in 2005, with an estimated 81,500 users. Most of the irrigated land is in the valleys between mountain ranges, particularly in the northern, highly fertile Cibao Valley. About 60% of irrigation water is drawn from reservoirs, 39% from rivers and streams, and the balance from groundwater. Surface irrigation systems, especially those using furrows and channels, are most common. The country had an installed hydropower capacity of 470 megawatts in 2008 and three additional hydropower plants under construction, with an estimated capacity of an additional 240 megawatts (GDR 2012b; IBRD and IFC 2009; FAO 2000; World Bank 2012). The 2010 Constitution provides that water is a strategic national asset available for public use; drinking water is prioritized over all other water uses. The Constitution also states that the country’s rivers, lakes, and lagoons are in the public domain, and that the water resources are freely available, so long as any private property rights are respected. The State has the obligation to develop and implement effective policies to protect the nation’s water resources, including bodies of water (GDR Constitution 2010a). As of November 2012, the Dominican Water Law (No. 5852) continues to govern water rights. The Water Law was drafted in 1962 and amended in 2000. The law covers water uses, concessions and permits for water withdrawal and use, and establishes the governance framework for the country’s water resources. The law echoes the Constitution, stating that the country’s water and water bodies are considered to be in the public domain, subject to state regulation. Priority is given to uses for human consumption over agricultural and industrial uses of water (GDR 2012c; GDR Draft Water Law 2012d). Drafts of a new legislative framework for water resources, including a new Water Law and a Water Supply and Sanitation Law, were under consideration by the Senate in November 2012, reflecting a decade-long effort to create comprehensive and integrated water laws. The draft laws govern water rights and uses, concessions, and establish the governance framework for the country’s water resources. The draft Water Law expands significantly on the 1962 law, articulating the objectives of integrating the management of water and watersheds, prioritizing the preservation and restoration of the country’s water resources, and improving water quality. The draft law gives priority to uses of water resources for human consumption (drinking, cooking, washing, etc. 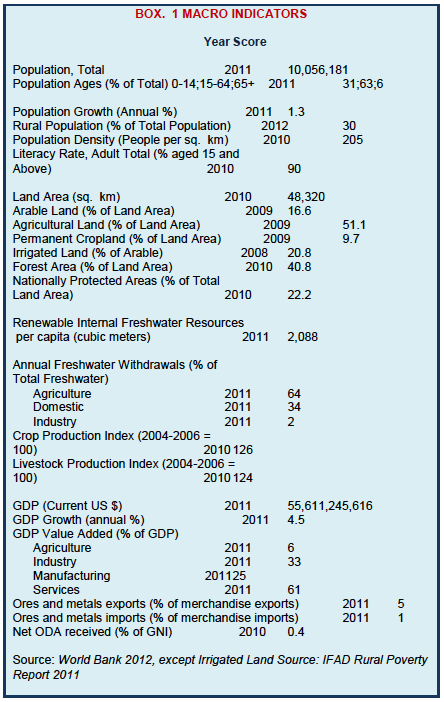 ), followed by environmental interests, irrigation, hydropower, industrial uses, and tourism. Exploitation of water for commercial, industrial, and other non-domestic use require permits and concessions. However, the draft law faces strong opposition from sectors of society that claim the changes would lead to privatization of water rights and would limit poor people’s access to water (GDR 2012c; GDR Draft Water Law 2012d). In 1997, the Dominican Republic water sector adopted a policy of decentralized control of rural and peri-urban water resources. The policy was intended to support a philosophy of local governance of resources, and relieve the central government of responsibility for developing and managing rural water systems. The actual devolution of authority, hampered by a lack both of funding and technical support, has been slow. The National Institute of Potable Water, also known as the National Water Supply and Sewage Institute (INAPA), is responsible for rural drinking water and sanitation. INAPA is part of the State Secretariat for Public Health (SESPAS) but operates as a separate entity, and has the legally mandated authority for domestic and industrial water supply and wastewater treatment in the Dominican Republic. INAPA has national-level jurisdiction, with some urban areas and provinces carved out and managed by semi-privatized operating corporations, such as the Santo Domingo Water Supply and Sanitation Corporation (CAASD) and Santiago Water Supply and Sanitation Corporation (CORAASAN). Transfer of the drinking water supply systems to local control, which requires development of community rural water supply associations (ASOCARs), has been slow and has faced challenges in implementation, especially where there are no donors or NGOs supporting the development of local capacity. Nor does the system’s fee structure provide sufficient funds, saddling operators with the costs of maintenance and development of new systems. As a result, some systems have fallen into disrepair or are not working to full capacity (Lockwood 2001; Werbrouck et al. 2004; OAS 2005). The National Water Resources Institute, aka National Institute of Hydraulic Resources (INDRHI), is an autonomous state agency that was created in 1965 and is currently part of the Ministry of Environment and Natural Resources. INDRHI has responsibility for administering, managing, planning, developing, and regulating water resources to plan for the sustainable use of the country’s water. INDRHI also oversees the design, implementation, and monitoring of programs and initiatives to control surface and groundwater. Most of the country’s locally-based irrigation systems are managed and operated by Water User Associations. The Department of Irrigation Districts is within INDRHI and is responsible for managing and operating those irrigation systems in the country that have not been transferred to Water User Associations. The National Water Resources Institute, the Ministry of Agriculture, and the Ministry of Environment and Natural Resources share responsibility for river-basin management and water conservation. The National Water Observatory is responsible for managing water flow and operation of the country’s dams. The Vice-Ministry for Soils and Waters, which is one of five vice-ministries in the Ministry of Enviroment and Natural Resources, is responsible for watershed management and administration (FAO 2000; INDRHI 2012; GDR and UNDP 2007). The Ministry of Public Health and Social Assistance is responsible for water quality, and is supported by INAPA as well as provincial water and sewage companies. The Rural Water office is within INAPA. INAPA operates as a separate entity with legally mandated authority over domestic and industrial water supply and wastewater treatment in the Dominican Republic. INAPA has national-level jurisdiction, except for two urban areas (Santo Domingo and Santiago) and two provinces (Espaillat and La Romana), in which semi-privatized operating corporations have been established for service provision (Lockwood 2001; FAO 2000). The draft Water Law, still pending in 2013, would replace INDRHI with a National Water Authority (ANAGUA). Like INDRHI, ANAGUA is conceived as an autonomous public body, governed by a Board of Directors and managed by an Executive Director. Board members include the Minister of Environment and Natural Resources (who presides), the Minister of Finance, the Minister of Economy, Planning and Development, the Minister of Agriculture, the Director of INAPA, the Director of the Dominican Hydropower Generating Company (EGEHID), the President of the National Irrigators, and two representatives of civil society, appointed by the Executive Director. The Board is responsible for approving water policies, reviewing and monitoring the execution of work plans and approving concessions. The Executive Director develops the National Hydrological Plan and monitors its implementation, and is responsible for ensuring that the country’s waterworks and water infrastructure operate as intended. The Executive Director is also responsible for ensuring the appropriate distribution of the country’s water resources, supporting irrigation development, and promoting coordination of decentralized water governance bodies. The draft law also provides for the establishment of water districts and watershed councils, all of which have representation from various sectors, and the authority to manage those water resources within their jurisdiction (GDR Draft Water Law 2012d). Reforming the legal framework for the water sector and the supporting governance bodies has been a major agenda item for the GDR for the last decade. Drafts of the new Water Law and the Water Supply and Sanitation Law have been circulating for several years. The current draft of the Water Law makes liberal reference to the development and use of a comprehensive National Hydraulic Plan to guide the country’s water resource management and conservation strategy (GDR Draft Water Law 2012d; Werbrouck et al. 2004). In August 2012, INDRHI published a National Hydrological Plan that outlines water policy guidelines designed to prioritize competing water uses and address limitations on water resources. The plan promotes watershed planning and targeted investments in the water sector to meet the demands of different user groups. The plan also sets indicators and goals, allowing for monitoring and evaluation of progress against the plan. Depending on the adoption of the new Water Law, either INDRHI or ANAGUA will be responsible for implementing the National Hydrological Plan (Hoy 2012). With the assistance of engineers from the University of Utah (USA), INDHRI has been developing a digital cadastre of irrigation water users. The cadastre shows property boundaries, water resources, irrigation systems, and cropping. Water User Association members have been trained on the use of the cadastre to monitor water use, identify water users, and plan maintenance (Neale 2012). The state-owned power company, CDEEE, and the Dominican hydroelectric company, EGEHID, have been rebuilding the hydroelectric dam, Aguacate, and the artificial lake, Las Barias, which were damaged in storms in 2007. The US $19 million project is under the GDR’s Natural Disaster and Emergency Recovery and Risk Management Project, which is funded by the World Bank. The rehabilitation of the facilities is predicted to add 200 megawatts annually to the Dominican grid (Dominican Today 2010). The World Bank has been supporting the development of the new legal framework governing water resources and the development of the governance structure through its US $27.5 million Water and Sanitation in Tourist Areas project (2009–2013). Project objectives are: (1) to strengthen and consolidate the policy framework of the water and sanitation sector; (2) to improve and expand access to sanitation and wastewater treatment and disposal services in the Puerto Plata region (north coast); (3) to improve the financial and operational performance of CORAAPLATA, the region’s water utility; and (4) to enhance operational and commercial performance of other regional utilities and prepare them to participate in the second phase of the Program. At the time of the midterm evaluation in 2012, the GDR had created a National Water Council, a draft revised water law had been submitted to the GDR, and the GDR was in the process of finalizing the national Water and Sanitation Strategy. The mid-term evaluation rated progress as unsatisfactory because of the delays (Debomy 2012). In 2012, the Inter-American Development Bank (IDB) initiated the US $25 million Santiago Water Supply Service Improvement Program to improve access to drinking water in the metropolitan area of Santiago de los Caballeros for 329,000 residents. The specific objectives are: (1) to improve the continuity of drinking water service in areas where it is deficient; (2) to reduce energy consumption in water production sources and distribution systems; and (3) to improve operational efficiency by improving business management and corporate governance. Project components include implementing better pumping systems, pipe replacement and improved feedback systems, and providing support to service governance with corporate governance programs and information systems (IADB 2012b). USAID provided early support for the development of water user associations in the Dominican Republic through its On-Farm Water Management project. Beginning in the late 1990s, USAID supported the National Water Supply and Sewage Agency (INAPA) with technical assistance designed: (1) to develop and strengthen INAPA’s institutional capability to decentralize rural water supply and sanitation (RWSS); (2) to incorporate lessons learned in the application of the total community participation model into INAPA’s work practice and contracting; and (3) to help INAPA find the most appropriate follow-up and monitoring strategy for the operation and maintenance and sustainability of RWSS systems. USAID supported the development of a community participation methodology in eight new systems constructed by NGOs in a pilot project in the area of Hato Mayor (a coastal province in the northeastern section of the country) (Lockwood 2001). Through the UNDP and Global Environmental Facility (GEF) Small Grants program, UNDP has been supporting local NGOs in the development of small sustainable energy projects. More than 70 projects have been funded, including ten micro-hydros. The pilot experience has been expanded and scaled-up to support micro-hydro construction in poor, isolated communities that will not be on the national electric grid in the near and mid-term. With financial support from the European Union, the Dominican Government, and UNDP, a network of mini-hydros is being established, with community cooperatives managing the production and use of energy produced. As of August 2011, nine micro-hydro projects had been built, with an installed capacity of 253 kilowatts and benefiting 4,000 families. Twenty-two additional projects were in the planning stages (UNDP 2009; Dominican Republic Live 2011). More than one-third of the Dominican Republic’s land is covered in highly varied and diverse forestland. The country has high-elevation cloud forests in northern, central, and eastern parts of the country and broad-leafed humid forests in lower elevations, often found mixed into traditional coffee and cacao plantations. Conifer forests of native pine, ferns and orchids cover the high mountain areas of the Central mountains. Dry forests are widespread in the south, southwest and eastern tips of the country. In the driest areas of the south, southeast and east, cacti and thorn brush dominate, and mangrove forests are found in the south. The Global Forest Resources Assessment estimates that the country has 41% forest cover (over almost 2 million hectares of land); a national survey in 2010 reported 9% less (only 32% of total land). The GDR has created over 100 “protected areas,” which constitute about 22% of the country’s total land mass (FAO 2010; World Bank 2012; IRG 2001). The country’s forests support significant biodiversity with high levels of endemism (1800 plant species, two mammals, 26 birds, 138 reptiles, and 63 amphibians) that mark many island ecosystems. Ninety-four percent of the country’s reptiles and 33% of its vertebrates are threatened or endangered, including the solenodon (a venomous, shrew-like mammal with a scaly tail and flexible snout) and the rhinoceros iguana. Forest biodiversity is threatened, however, by non-native invasive species, illegal logging, soil erosion, forest fires, unregulated tourism and industrial factories development, conversion of forest land to other uses, illegal trading in forest plants and animals, and climate change (IBRD and IFC 2009; USAID 2011). In the 1970s and 1980s, the Dominican Republic had high levels of deforestation; in the 1990s, halting its pace was a top environmental priority. A combination of donor-supported GDR efforts and circumstances –including reforestation programs and designation of protected areas, the introduction of subsidized, non-wood cooking fuel, and high rural-urban migration –stabilized the rate of deforestation. From 1999 to 2010, the extent of Dominican forest has remained constant. Nonetheless, the consequences of past deforestation remain, especially in areas where large tracts of land without forest cover are still vulnerable to erosion from tropical storms and flooding. Expanding agricultural areas and the development of other natural resources, such as minerals, also put pressure on forests. In addition, the deforestation statistics do not identify the types of forest lost and gained, and some observers note that the 0% deforestation rate has been achieved by the creation of plantations that have masked the loss of natural forests. Between 1990 and 2009, an estimated 16,000 hectares of plantation were certified. As much as 70% of reforestation has used exotic species that have, arguably, failed to benefit forest health by supporting overall biodiversity or improving soil quality (Werbrouck et al. 2004; IBRD and IFC 2009; FAO 2012). The 2010 Constitution contains specific provisions governing the country’s forests. Forest protection and management is a national priority and in the social interest of the country. The Constitution promotes reforestation, forest conservation, and renewal of forest resources by supporting the establishment of protected areas (GDR Constitution 2010a). The 1999 Forestry Law (Law No. 118-99) sets out the definitions of forestland, how forest lands are to be registered, regulations for commerce and industry as related to forest lands, regulations for the protection of forest lands, programs for investment, education and incentives to expand forest lands, as well as sanctions and judicial procedures to adjudicate violations of the law. The law provides incentives for reforestation and allows the creation of special incentives to promote the valuation of the environmental services of forests, including carbon sequestration. The law created the National Forestry Resource Institute, the Forestry Fund and the Management Plan for Forest Lands (REDD Desk 2012a). The Environmental and Natural Resources Law, No. 64-00 (2000) governs the Dominican Republic’s environment and natural resources, including forests and related natural resources. Forestry regulations issued in 2001 under Law No. 64-00 include regulations concerning payment for ecosystem services, forest land tenure, forestry industry, forest conservation, research and management, and the government’s administrative roles. The objectives of the regulations are: (1) to promote and regulate the protection and sustainable use of forest resources; (2) to provide the necessary rules that allow the incorporation of civil society in the development, management and conservation of these resources; (3) to ensure the effective management, conservation and sustainable development of existing forests and forest recovery in areas currently devoid of vegetation; and (4) to promote the restoration and development of forest lands suitable to fulfill the function of soil, water and biodiversity conservation, as well as stimulate rural development through the generation of employment (REDD Desk 2012a). Law 202-04 governs the country’s protected areas. Passed in 2004, the law aims to conserve and preserve representative samples of the different ecosystems and the natural and cultural patrimony of the Dominican Republic. The law sets criteria for protected areas, norms for managing protected areas, and sanctions and penalties for non-compliance (REDD Desk 2012a). The legal framework governing forests requires forest management plans and delineation of forest boundaries. To date, forest offices have lacked the financial and human resources to implement the laws. The boundaries of some national forests and protected areas are not mapped, and very few management plans have been created. Only 10 to 15% of the Dominican Republic’s forest is on private land (Werbrouck et al. 2004). Many communities, particularly in remote areas of the country, live in and rely on the forests for their livelihoods. Engagement of local communities in forest management in the Dominican Republic has historically been uneven. In the 1990s, the government used the army to resettle numerous communities in newly identified protected areas and in buffer zones outside those areas. In many cases, little if any public consultation took place, and residents reported confusion regarding the park boundaries and the nature of newly designated protected areas and parks. However, in at least one study of four communities, residents reported an awareness of forest conservation principles and expressed disappointment that they were resettled rather than included in management plans for the protected areas. More recently, government programs have included local communities, although the programs are primarily plantation and reforestation programs, with NGOs serving as the managers of the forestation campaigns (Stycos and Duarte 1994; FAO 2011). Responsibility for the environment and for natural resource management, including forest management, is consolidated under the Ministry of the Environment and Natural Resources. The National Council for the Environment and Natural Resources promotes interaction of environmental agencies with other institutions and the private sector, and the National Fund for the Environment and Natural Resources is responsible for financing programs, research, and education. The National Council and National Fund are separate entities integrated by the Ministry of Environment and Natural Resources, which has administrative authority over them and presides over their boards of directors (Werbrouck et al. 2004; Romero 2012; FAO 2012). The Deputy Ministry of Forest Resources is responsible for promoting sustainable management of the forests and reforestation, assisting in the formulation of forest policy, supporting plantation development and timber production, approving forest plans on private land, helping develop management plans for forest use on public land, and coordinating local communities and associations working in forest areas. Within the ministry, the Directorate of Forestry Development and Reforestation is responsible for the development of reforestation programs and the establishment of plantations. The Directorate of Forest and Forest Management is responsible for ensuring compliance with laws and regulations, implementing projects, and enforcement (GDR 2012e). The Dominican government has been actively responding to the challenges posed by climate change. In 2011, the National Council on Climate Change and Clean Development Mechanism presented a draft Strategic Plan for Climate Change 2010–2030. The Plan sets out policy measures, adaptation strategies, and mitigation steps for various sectors, including in the areas of agriculture and food security, biodiversity and forests, coastal and marine environments, human settlements and infrastructure, and energy and tourism. With the assistance of the government of Germany and The Nature Conservancy, GDR also produced its draft Climate-Compatible Development Plan (CCDP) in 2011. The draft CCDP estimates the country’s emissions under business-as-usual conditions and identifies options for emission abatement, including concrete action plans and an overarching implementation strategy (GDR 2011b; La Republica 2011). The Dominican Republic is a Reducing Emissions for Deforestation and Forest Degradation (REDD) + Partnership partner country, although it is not currently a member of the UN-REDD Programme, the Forest Carbon Partnership Facility (FCPF), or the Forest Investment Programme (FIP) of the World Bank. The country’s REDD activities tend to be relatively small-scale, sub-national projects focusing on building capacity in agroforestry techniques and reforestation. At a national level, the largest ongoing activities come under the umbrella of regional programs for Central America, such as the Dominican Republic–Central America–Free Trade Agreement (CAFTA-DR) Environmental Cooperation Program funded by USAID, and the Regional REDD Program in Central America and the Dominican Republic, funded by the German Organization for International Cooperation (GIZ) (REDD Desk 2012b). In 2009 the GDR added protected areas into its national protected areas system, encompassing a total of 1.3 million hectares of terrestrial and (primarily) marine habitat. The Nature Conservancy assisted GDR with technical assistance and support for sustainable finance tools such as park user fees and concessions that provide constant, renewable sources of operating funds, and dedicated conservation trusts and endowments which, when fully funded, will provide US $10 million in permanent annual funding for research, management, maintenance and the growth of the parks (TNC 2011). The Germany Agency for Technical Cooperation (GTZ) has been working closely with the GDR on creating a system for monitoring Dominican’s forest areas to allow it to track forest cover and calculate carbon emissions and reserves for REDD programs (GDR 2011c). The government of Norway is financing a US $3.5 million, four-year, Green Border Project, in coordination with the United Nations Development Programme (UNDP), the UN Environment Programme (UNEP), and World Food Programme (WFP). The project is designed to increase vegetative cover and improve living conditions on the border between Dominican Republic and Haiti. As of 2012, the project had reforested about 300 hectares, established three community centers to grow seedlings for reforestation, provided training for local authorities and farmer organizations so they can manage their natural resources in a more sustainable way, and created 450 jobs (UNDP 2011; UNDP 2012). The NGO Plan Sierra began in 1979 with the goal of improving the forest coverage in the Central Mountain range. The organization includes public and private sector actors, including forest cooperatives and groups such as the Association of Coffee Growers. The organization succeeded in improving forest coverage in the project area from 22% in 1979 to 52% in 2012, and has branched out into other activities such as the creation of plant nurseries and a vocational school. Plan Sierra has provided funding to small farmers on 1,014 coffee farms to increase production through sustainable practices. In addition, with funding from USAID, Plan Sierra rehabilitated 25,000 hectares of coffee farms destroyed by Hurricane George and helped coffee growers establish associations to share technical assistance and improve opportunities for obtaining credit. With funding from the French Development Agency (AFD) and GIZ, in the decade ahead the organization plans to reforest 25,000 hectares per year and promote ecotourism (Werbrouck et al. 2004; REDD Desk 2012b). USAID supported The Nature Conservancy’s Parks in Peril program. The program created local capacity to conserve biological diversity by concentrating on a single local NGO partner in order to build the full range of technical and institutional capacities required to manage biodiversity and its own organization over the long-term. TNC developed its Institutional Self-Assessment Tool (ISA) to diagnose the areas for improvement of NGO partners and prescribe institutional strengthening action plans to increase their durability. In the Dominican Republic, TNC partners with Pronatura, Fundación Moscoso Puello (FMP), and Fundación para el Desarrollo Comunitario (FUDECO). The project has included institutional strengthening, training in conservation management tools, and training in extension activities such as agroforestry, sustainable agriculture, beekeeping and fishing techniques (TNC 2008a; TNC 2008b). The Dominican Republic’s mineral resource wealth is primarily located in the Hispaniola Gold Copper Back Arc, a volcanic formation running northwest to southeast across the country’s mountainous interior. In 2012, the country’s geology society estimated the country had US $58 billion of unexplored reserves of minerals and metals. Based on the entity’s calculations, the underground treasure includes about 27 million ounces of gold, 168 million ounces of silver, 652 million pounds of copper, six billion pounds of zinc, and 25 million pounds of nickel. The country also has significant reserves of iron, limestone, gypsum, mercury, sulfur, marble, onyx, travertine and a variety of industrial minerals. Salt Mountain, a 16-kilometer block of almost solid salt west of Barahona, is the world’s largest known salt deposit, and the country is one of the few sources of amber in the Western Hemisphere (Metz 2001; Haggerty 1989; Globe Newswire 2012). The Dominican Republic’s minerals –especially its gold –have been mined for centuries. Taino Indians collected gold nuggets from rivers and the Spanish mined gold on the island as early as the 1520s. Rosario Dominicano, initially a private enterprise with a minority state interest, opened the country’s most prominent mine, Pueblo Viejo, in 1975. The mine, which is located about 100 kilometers north of Santo Domingo, was the largest open pit gold mine in the Western Hemisphere; in 1979, GDR purchased the remaining equity, creating the largest Dominican-owned company. The government ran the mine for two decades, closing operations in 1999 and leaving an environmental time bomb. In 2006, a Canadian company, Barrick Gold Corp, bought the mine, and spent an estimated US $75 million to clean up the site, with additional monetary contributions provided by the European Union (EU). The mine resumed production in August 2012. In addition to gold reserves estimated at 25 million ounces ($40 billion at 2012 prices), the mine has 148 million ounces of silver, and 530 million tons of copper. However, there have been a series of protests from local farmers and ranchers claiming that the mining activities pollute rivers and that the Dominican people derive little benefit from the mine. President Medina responded that the contract between the government and Barrick Gold is “unacceptable” and must be revised (IBRD and IFC 2009; Globe Newswire 2012; Haggerty 1989; Fox and Lopez 2012; Bloomberg 2013; Dominican Today 2013b). The country also has a ferronickel mine in Bonao (northwest of Santo Domingo) that is the second largest in the world. The Dominican Republic also produces sand, gravel, limestone, marble and salt. Six artisanal mining associations produce modest amounts of pectolite (larimar), amber, and limestone (Haggerty 1989; Pellerano and Herrera 2005). The rise in gold prices created a boom in the country’s mining sector. Between 2009 and 2012, estimated total investment in the sector was US $4 -5 billion. In addition to a dozen major mining companies, local residents engaged in small-scale and artisanal gold mining. Reports of locals discovering large gold nuggets are frequent enough to keep the rivers crowded with gold panners (Global Newswire 2012; Veiga 1997). The country has had a poor history of managing the environmental consequences of mining operations. Downstream of metal mining, flows of effluents show high levels of cadmium, chrome and other heavy metals. High levels of mercury have been found in the waters of Samana Bay. Pesticides and persistent organic pollutants have been reported in estuary mollusks. When the GDR closed the Pueblo Viejo, the two large open pit mines were left exposed, and piles of discarded sulfide rock remained, leaching acid and heavy metals like arsenic and cadmium and mercury into the watershed. Runoff from the site flowed down the mountain, creating fields of mineral waste, turning rivers red, and destroying the local ecosystem (Mines and Communities 2007; Werbrouck et al. 2004; Fox and Lopez 2012). The 2010 Constitution provides that minerals are managed by the state for the benefit of the country. Mineral deposits, hydrocarbons, and non-renewable natural resources can only be explored and exploited by individuals under grants, contracts, licenses, permits or quotas, as determined by law. The Constitution further states that the benefits received by the State for the exploitation of natural resources will be devoted to the development of the nation and of the provinces where such resources are located, at the rate and conditions set by law (GDR Constitution 2010a). The Dominican Mineral Law (No. 146) was adopted in 1971 and implemented by Decree No. 207-98 in 1998. Subordinate laws include Decree No. 613-00 (2000), creating the National Council for Mining Development; Decree No. 839-00 (2000), declaring mining as a priority activity and instructing the Corporate Mining Authority to enter into agreements for the development of the sector; and Decree No. 947-01 (2001), creating industrial mining parks (Rizik and Garcia 2012). The Mineral Law and subordinate laws provide that minerals are the property of the state. Any national or foreign person or entity (but not foreign governments) can register the discovery of minerals and apply for a concession to explore or exploit the deposit. The state is a mandatory participant in any mining operation. Concessions are granted for 75 years, limited in area to 20,000 hectares, and include the right to create infrastructure related to mining. Minerals are the property of the state, but the concessionaire receives the right to profit from their extraction (Rizik and Garcia 2012; Pellerano and Herrera 2005). The Environmental and Natural Resource Law (No. 64-00) also governs the mining sector. The law requires an environmental evaluation and plan as a condition of receiving any permit or concession for exploration, extraction, artisanal mining, or operation of aggregate processing plants (Rizik and Garcia 2012). Dominican law includes a number of significant, pro-community provisions governing mining concessions and mining operations. Concessionaires must negotiate and reach agreement with any landholders affected by mining operations, conduct environmental assessments and implement an environmental plan, perform work in a manner that avoids damage to landowners and any adjacent concessionaires, maintain a workforce at least 80% of which must be composed of Dominican citizens (with salaries totaling at least 80% of the total sum paid by the employer to all employees), and pay a mandatory 5% of their net generated profits to the municipality in which the minerals were located (Rizik and Garcia 2012). Anecdotal reports suggest that some mining operations have failed to meet these standards, and enforcement of the standards designed to protect local community and environmental interests has been limited. In November 2012, local communities began protesting gold mining practices, including the use of cyanide, which farmers believe is spoiling their crops and polluting the water. NGOs and citizen groups allege that the terms of the mining agreements regarding relocation and employment were not made public, preventing communities from enforcing the terms (Sewell 2012; Els 2012). Mining concessions have a nonexclusive right to use fluvial waters needed for mining activities and are entitled to use the water that is discovered during mining operations. Concessionaires are required to purify the water after use and return it to its source. If mining operations require water from third parties, agreement must be reached prior to the award of a concession (Rizik and Garcia 2012). The Office of the President, Ministry of Industry and Trade, and Ministry of Environment and Natural Resources have jurisdiction over mining. The General Mining Directorate, which is within the Ministry of Industry and Trade, is responsible for coordinating geological studies, reviewing and approving concessions, enforcing legal standards governing mineral exploration and extraction, recommending regulations, and assisting GDR in developing the marketing and export of the country’s minerals and mining. The Directorate also has authority to grant rights attendant to the mineral extraction process, such as the right to use the land above the mineral deposit. The Corporate Mining Unit serves as the operational collaborator in all mining projects in which the GDR is a participant. The Unit’s engagement is, in part, designed to ensure that private investment in the sector is clear, credible and guaranteed (Rizik and Garcia 2012; GDR 2012f). With a US $30 million grant from the EU, the General Mining Directorate undertook a six-year plan (2006–2012) of institutional strengthening designed to support investment in the mining sector and develop capacity to address environmental and social issues. The plan, known as SYSMIN II, included support for the clean-up of the Pueblo Viejo mining site (which was also supported by the new mine operator), the development of a system of geothematic mapping, a geological survey (assisted by the government of Spain), and development of economic diversification programs for communities in mining areas (GDR 2012g). The SYSMIN II plan, funded by the EU, includes a component focused on artisanal and small-scale miners. The plan provided for technical assistance in mining operations, equipment purchases, and included €500,000 support to artisanal miners in Santo Domingo and Sierra de Bahoruco to develop the artisan jewelry sector, including technical assistance and the development of a craft school (GDR 2012h). Salva Tierra is a Dominican NGO focused on environmental issues. Salva Tierra, in conjunction with other local NGOs such as the Padre Rogelio Foundation, has led demonstrations at mining sites and government offices to protest the development and expansion of mining; Salva Tierra also supports local communities protesting the environmental damage caused by mining operations. In at least one case relating to open pit nickel mining at Loma Miranda in the Central Mountains, protests led to a GDR request for UNDP to conduct an assessment of the impact of nickel mining operations, resulting in a court-ordered suspension of mining activities and a call for a third-party investigation (Salva Tierra 2012; Els 2012).